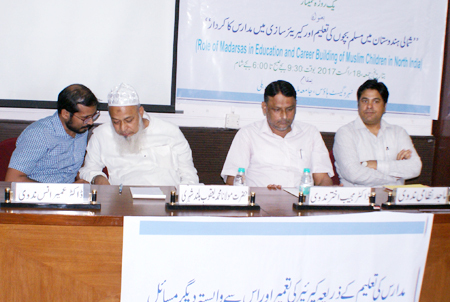 The Institute of Objective Studies (IOS) organised a one-day seminar on “Role of Madarsas in Education and Muslim Children in North India” on August 18, 2017 at Nehru Guest House, Jamia Millia Islamia in association with the Civil Society Network. Spread over five sessions, the seminar discussed issues relating to the content of the syllabi of madarsas, off-take of students for admission to various courses in Indian universities and their financial health. The chairman, IOS, Dr. Mohammad Manzoor Alam, who summed up the proceedings of the seminar, stressed the need for the integration of knowledge. He said that the integration of madarsa education and modern education could respond to challenges of today that our world was faced with. The purpose of education should be to serve humanity as visualised in the holy Quran and Hadith. Human dignity had to be restored at all costs if the world in which we lived wished to survive as an abode of peaceful co-existence. Referring to Islam’s dominance in the world in various fields of knowledge 400 years ago, he said that Islam produced a scholar like Ibne Khaldoun who was described by the West as the father of sociology. Similarly, Idrisi’s contribution to geography was well recognised by Western scholars. Since the Quran and Sunnah were the fountainhead of Islamic life, the integration of knowledge was a must for a bigger role in the mundane world. This had become all the more necessary in the present context as education was commercialised today. Referring to the nine suggestions made during the seminar, he said that the IOS would organise workshops to understand and exchange views among the participants. He agreed to help open schools imparting modern education within the jurisdiction of madarsas so as to prepare madarsa students to keep them abreast of students receiving modern education. 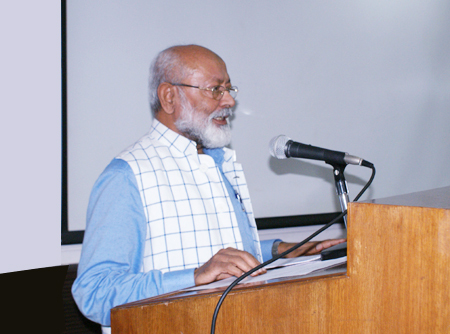 Dr. Alam praised Maulana Azad University at Jodhpur in Rajasthan for running several institutions. It may be recalled that the university accepts grants from the government and makes optimum utilisation of funds made available to it. He said that the aid given to the university for computer education was fully utilised with the result that more and more students were becoming computer-savvy. Stressing the need for thinking in terms of quantity of education at a time when the rate of literacy among Muslims was less than that of Dalits, he observed that it was futile to hanker after quality of education. Rather, it must be quantity plus quality, he said. He asked the madarsas to also open Sanskrit schools and assured that the IOS would contribute its bit in this endeavour. While asking the participants to send their talks in an article form within 15 days, so that a book based on them could be published, he said that all the suggestions made at the seminar would be thoroughly discussed at the next General Assembly meeting. Earlier, the inaugural session began with the speech of the Finance Secretary, IOS, and former HoD of Islamic Studies, Jamia Hamdard, Prof. Ishtiyaque Danish. He said that the religious and community awakening among Muslims was due to the Islamic seminaries. Since the conditions prevailing in 1857 changed in 1947, madarsas too needed to change themselves accordingly. Laying stress on the need for hike in the salaries of madarsa teachers and imams of mosques, he said that they too were a part of society and faced same problems as others. He pleaded for the replication of the experiment in Kerala where religious education was imparted to students in the morning and school curriculum was taught in the evening. General Secretary, Civil Society Network, Dr. SM Mahmud introduced the topic. 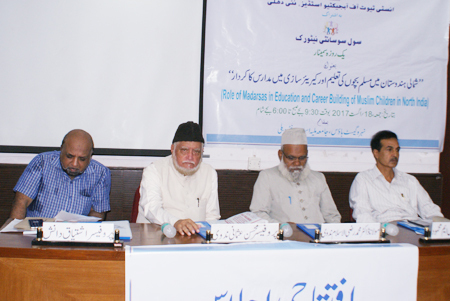 In his main address, Secretary, Tasneefi Academy, Jamaat-e-Islami Hind, Maulana Md. Raziul Islam Nadvi emphasised that government officers should also be invited to the programmes organised by the madarsas. Presiding over the session, former professor and dean, Middle East and African Studies, English and Foreign Languages University, Hyderabad, Prof. Mohsin Usmani, opined that the same mistakes were being repeated by Muslims in India as were committed by them in Spain. In Spain, Muslims excelled in knowledge, but failed to cultivate contacts with the people of other religions. He said that in India we had maintained a distance with 80 percent of the population, that of non-Muslims. This was contrary to the teachings of the Prophet (PBUH). Since the madarsa pass-outs were unable to address the 80 percent of the population, the teaching of Hindi and English along with Arabic had become imperative, he added. The first technical session devoted to “The Role of Madarsas in the Education of Muslim Children and the need for the improvement of curriculum” was chaired by Mufti. Mohammad Arshad Farooqi. The main speaker at the session was Dr. Mohammad Nasim Akhtar, deptt. of Arabic, JMI. In his speech, Dr. Akhtar called for change of the madarsa syllabus. Madarsa syllabus, he said, should be subject-oriented, instead of book oriented. Madarsas were still teaching the same books that were prescribed a 100 years ago. He suggested that the madarsas should endeavour to open such schools where 70 percent of the curriculum was devoted to modern education and the rest 30 percent of religious education. 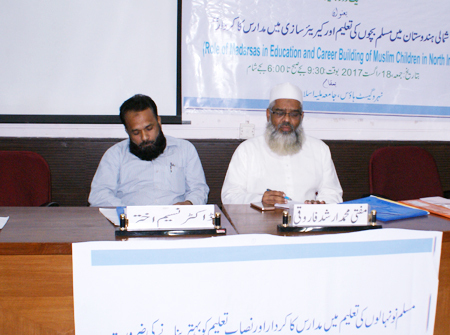 The second technical session focused on “Career Building through Madarsa Education and Related Issue”. The session was chaired by Maulana Mohammad Yaqoob Bulandshahri. 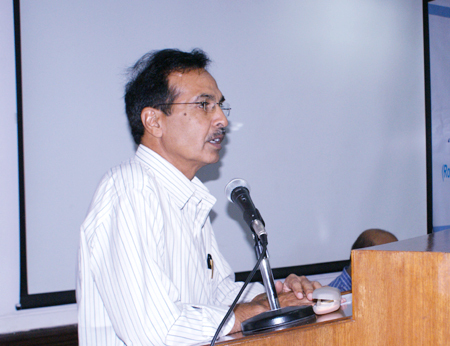 Dr. Mujeeb Akhtar Nadvi, assistant prof., deptt. of Arabic, Delhi University, addressed the session as the main speaker. He suggested that subjects like science, mathematics, Hindi and English should be included in the madarsa curriculum from 6th standard. Dr. Umar Anas Nadvi, research fellow at the Indian Council of World Affairs, complained that madarsa students always stuck to their attitude and never opened up to the outer world. 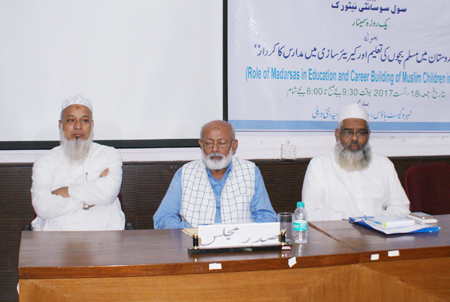 The third technical session centred on “The Problems of Madarsas and the Ways of Improvement in Madarsa Education”. Former HoD, deptt. of Islamic Studies, JMI, Prof. Shafiq Ahmad Nadvi chaired the session, assistant professor of Arabic, Delhi University, Dr. Mohammad Akram delivered the main address. In his speech, he said that the madarsas today faced several problems. They were targeted by the government on one hand and were publicly criticised on the other. Prof. Shafiq pleaded that madarsas should be allowed to pursue the mission for which they were opened. They were needed by the Muslim community the most, he said. The valedictory session was presided over by Dr. Mohammad Manzoor Alam. 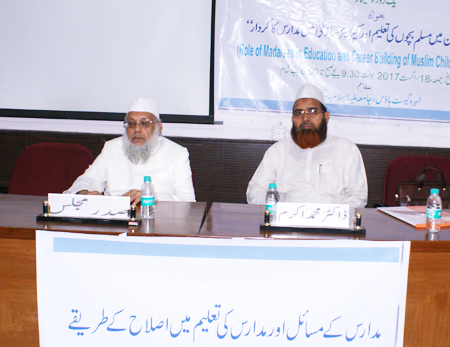 Maulana Mohammad Yaqoob Bulanshahri, president, All India Dini Madaris Board, and Mufti Mohammad Arshad Farooqi, chairman, Fatawaa online expressed their views at the session. 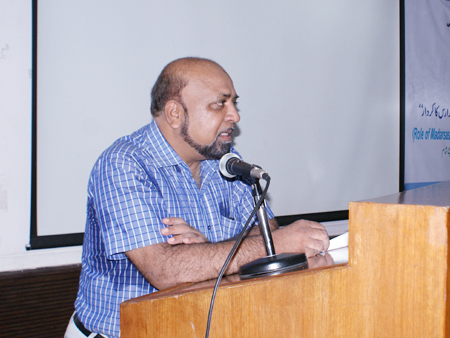 The proceedings of the seminar were conducted by Maulana Ajmal Farooq and Dr. Nakhat Husain Nadvi of the IOS. 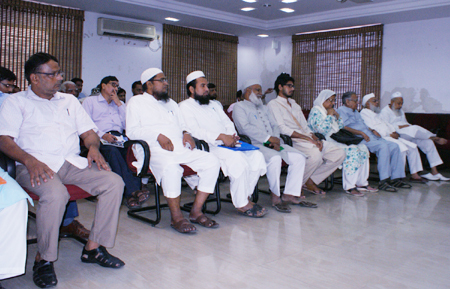 The seminar was attended by Islamic scholars, madarsa teachers, university teachers and concerned citizens.